MARCH 4—Under the guise of a “humanitarian aid” convoy, on February 23 the U.S. imperialists and their right-wing Venezuelan stooges tried to breach the country’s border with Colombia, that is, open Venezuela up to a potential invasion. Occurring one month after Juan Guaidó declared himself Venezuela’s president, this episode in the drive to bring down the bourgeois-nationalist regime of Nicolás Maduro was an abject failure. But Washington has vowed to press ahead. While Republicans and Democrats alike shriek about a humanitarian crisis, it is the U.S. that is strangling Venezuela’s people with savage, constantly escalating economic sanctions. We say: Hands off Venezuela! Down with the sanctions! From Trump to self-described “socialists” in the Democratic Party, the entire spectrum of American bourgeois politicians declaims that Venezuelans need to be saved from an evil despot who is blocking aid and starving his own people. This is just “humanitarian” cover for U.S. attempts to install an utterly subservient government in this oil-rich country. Such attempts date back to a U.S.-engineered coup attempt against populist strongman Hugo Chávez in 2002. Trump’s aid convoy was openly billed as aiming to topple Maduro, Chávez’s successor, by sparking a mutiny among Venezuelan soldiers and splitting the officer corps, Maduro’s chief prop of support. A New York Times (16 February) article made Washington’s intent clear. It cited the head of the U.S. Southern Command, Admiral Craig S. Faller, who “said it would be premature to discuss whether American troops could be tasked with delivering aid on Venezuelan soil, a mission that would entail significant risks in a nation awash in weapons. But he said the American military has become experienced in getting aid to people under trying circumstances.” That’s one way of putting it. U.S. imperialism has long used aid agencies as tools for its machinations, such as to prevent the “spread of Communism” during the Cold War. Running the Venezuela operation is Elliott Abrams, who used a “humanitarian aid” program to funnel $27 million worth of weapons to the right-wing contra death squads fighting Nicaragua’s Sandinista government in the 1980s. And it was under the pretext of aid that Barack Obama sent troops to Haiti in 2010 to enforce imperialist order following the devastating earthquake. Cautioning against a unilateral approach in Venezuela, Rebecca Chavez, who served as Obama’s deputy assistant secretary of defense for the Western Hemisphere, told the Times that while it was “very likely” that the U.S. would intervene militarily, it should be as part of a coalition. The Democrats feel that the campaign would have a better shot if it’s not just U.S. troops marching in to overthrow Maduro. There’s nothing new in Sanders, a capitalist politician, supporting U.S. war moves. While the International Socialist Organization (ISO) and Socialist Alternative (SAlt) were going gaga over his presidential bid three years ago, we pointed out that he had voted time and again to fund the U.S. occupations of Iraq and Afghanistan (“Bernie Sanders: Imperialist Running Dog,” WV No. 1083, 12 February 2016). Now, while the SAlt faithful hail Sanders’s 2020 campaign as a “working-class fight back,” the ISO timidly complains that “he doesn’t challenge the Pentagon the way he calls out Wall Street” (socialistworker.org, 27 February). The truth is that the Pentagon serves the interests of “Wall Street,” i.e., the capitalist ruling class. The reformists obscure the fact that imperialism is not a policy decision by one or another ruling-class party but the very essence of the decaying capitalist system, marked by the dominance of finance capital and competition among the advanced capitalist countries to control the world’s resources and exploit its labor. As Marxists, our opposition to U.S. intervention in Venezuela in no way implies political support to the bourgeois Maduro regime. Far from representing any kind of socialism, the “Bolivarian Revolution” was premised on maintaining the capitalist profit system and its repressive state. At the same time, Chávez’s anti-imperialist rhetoric, support for the Cuban deformed workers state and anti-poverty programs earned him the enmity of the U.S. rulers and their local satraps. As long as oil prices were high, Chávez had the means to fund social programs and ensure that Venezuelan capitalists got a sizable cut of oil profits. However, the collapse in oil prices after Maduro took the helm in 2013 led to a severe economic contraction. Ensuing shortages of food and medicine, which Venezuela largely imports, were exacerbated by crippling debt payments to the imperialist bloodsuckers and economic sanctions imposed by the Obama administration. The Venezuelan billionaires who have monopolies on food production and distribution also resorted to hoarding and profiteering. Reporter Max Blumenthal recently posted a video of himself in an upscale Caracas supermarket that was fully stocked with food and household goods. But with hyperinflation and general economic collapse, working people cannot possibly pay the prices being charged. Both the traditional bourgeois oligarchy, which gave the U.S. free rein to pillage Venezuela’s oil wealth, and the boliburguesía, that section of the capitalists who enriched themselves under Chávez and Maduro, are class enemies of the workers and oppressed. Maduro and his bourgeois supporters, including in the military, are being targeted because they are not servile to Washington, not because they represent any challenge to capitalism. It is the proletariat that must lead the fight against the imperialists and their Venezuelan lackeys as part of the struggle to expropriate the bourgeoisie and take power in its own name. After Guaidó’s self-proclamation as president, we stressed that “the working class in the U.S. has a particular duty to oppose the imperialist machinations of its ruling class, which for over a century has slashed a long and bloody trail of wars, military coups, death squads and embargoes to keep Latin America under its jackboot” (“U.S. 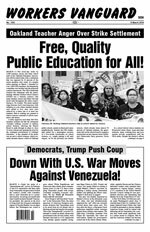 Imperialism Hands Off Venezuela!” WV No. 1148, 8 February). Opposition to U.S. intervention crucially involves defense of Cuba, where capitalism was overthrown in 1960-61. Speaking in Miami just before the Colombian border stunt, Trump ludicrously labeled Maduro “a Cuban puppet,” making clear that Washington’s war moves against Venezuela also target Cuba. Reed ended by calling on the masses in countries oppressed by imperialism to “unite with the Russian workers and peasants,” who, led by the Bolsheviks, had overthrown capitalist rule in the 1917 October Revolution, as well as with the workers of the imperialist countries. As a section of the International Communist League, the Spartacist League/U.S. continues the fight for new October Revolutions to smash capitalist imperialism once and for all.